Christopher Hodapp is a 32° Freemason and a member of the Masonic order of the Knights Templar. His first book, Freemasons For Dummies, has quickly become the most popular modern guide to the ancient and accepted fraternity of Freemasonry. He’s also the author of Solomon’s Builders: Freemasons, Founding Fathers and the Secrets of Washington D.C., and co-author of The Templar Code For Dummies. He attended Indiana University, the University of Southern California, Los Angeles Valley Community College, and California State University Northridge. In 2006, Chris received the Duane E. Anderson Excellence in Masonic Education Award from the Grand Lodge of Minnesota. He has written for Templar History Magazine, Masonic Magazine, The Scottish Rite Journal, The Indiana Freemason, and Indianapolis Monthly, and he’s a monthly columnist for Living Naturally First magazine. Chris has also spent more than 20 years as a commercial filmmaker. Alice Von Kannon has been an advertising executive, a teacher, a writer, and even a greedy and villainous landlord. A history junkie beyond the help of an intervention since the age of 14, her studies of Near Eastern religious cults and sects led to her first book, The Templar Code For Dummies, co-written with Chris Hodapp. She’s studied film production at Los Angeles Valley Community College and history at California State University Northridge, and she’s worked for many years in advertising as a writer and broadcast producer. Alice has traveled widely in Europe and the Middle East and written on the subject of the Barbary Wars and the birth of the U.S. Navy. She’s a member of Romance Writers of America and the Order of the Grail, the fraternal body of the International College of Esoteric Studies. Part I: Conspiracy Theories and Secret Societies: The Improbable Wedded to the Inscrutable. Chapter 1: Everything You Know Is Wrong. Chapter 2: Conspiracism and the Origin of Modern Conspiracy Theories. Chapter 3: Building the Perfect Beast: Secret Societies through the Ages. Part II: A Colossal Compilation of Conspiracy Theories. 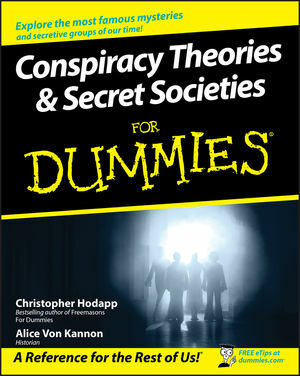 Chapter 4: Everybody Knows About It: The World’s Most Common Conspiracy Theories. Chapter 5: JFK and Other Presidents: The Conspiracies Behind the Guns. Chapter 6: The World Ends Monday — Racial, Religious, and Apocalyptic Conspiracies. Chapter 7: Not of This Earth: Innocent Pawns in an Intergalactic Imbroglio. Chapter 8: Tracking the Evolution of the 9/11 Conspiracy Theories. Part III: Secret Societies and Societies with Secrets. Chapter 9: The Freemasons: The World’s Longest-Running Secret Society. Chapter 10: Rosicrucians and the Evolution of Occult Secret Societies. Chapter 11: The Illuminati: The Bavarian Boogeymen. Chapter 12: Secret Societies of Terror and Death. Chapter 13: Frolicsome Fraternalism and Nefarious Foes of Freedom. Chapter 14: Thugs, Mugs, and Lugs: The Mafia and Other Underworld Societies. Chapter 15: Banks and Super Committees: Knowing All, Owning All, Controlling All. Chapter 16: Ten Conspiracy Theories That Skirt the Edge of Madness. Chapter 17: Ten Conspiracies That Were Absolutely True. Chapter 18: Ten Weirdest Secret Societies of All Time.